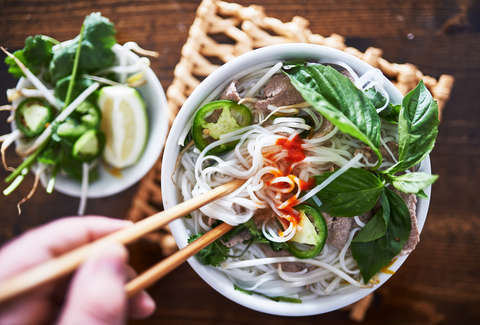 A pho restaurant in New Hampshire is being told to change its "offensive" name, and its owner is not having it. The offending name: Pho Keene Great. Considering that the city is named Keene, this is an honestly impressive pun. The quality of wordplay here doesn't seem to be swaying anyone though. The Vietnamese restaurant will be located in a publicly owned building, right next to City Hall, and is set to open on March 1, according to The Keene Sentinel. The trouble started on December 21, when owner Isabelle Jolie placed a sign in the window featuring a logo (with the name) and a message saying the restaurant was coming soon. Soon after, Jolie posted a Facebook message explaining that city manager Elizabeth A. Dragon had contacted her and requested the removal of the sign, citing its "offensive name and a contract violation as it relates to City ordinance." Strangely though, the issue isn't with the name itself, but with posting a profane sign. But since the owner needs a sign to, you know, announce that the restaurant exists, it amounts to the same thing. Dragon explained to The Sentinal that this lease is particularly restrictive because "it’s a publicly owned building, and we do have to be concerned about anything that could be interpreted by the public as offensive or use of profanity." "We really do want them to be successful," Dragon added. "I’m personally looking forward to frequenting her restaurant, but I do want to have a conversation with her about the sign and make sure that we are all comfortable moving forward." Jolie told The Sentinel that she took down the sign “as a good faith gesture, because we wanted to work with the city on this issue.” But that doesn't mean she's not pushing back. "If the city denies us a permit now due to our business name, which they have known since lease signing, that is a major issue since we have spent a lot of money," she wrote. Dragon and Jolie are scheduled to meet on January 11 to discuss further, but Jolie is trying to postpone till February to get further legal advice. In a press statement, Jolie explained that "we do not have any plans on changing our business name. We have spent many thousands of dollars investing in this venture because we believed in every aspect of our concept and that includes the branding and marketing of our business name. We have a tentative opening date of, March 1, 2019, and would like the blessings of Keene City government to have an exterior sign with our business name on it." If you feel like taking part in this saga, you can get a Pho Keene Great T-shirt, which Jolie is selling. The restaurant also took a Facebook poll that came out 97% in favor of the name not being offensive, but that poll seems... less than conclusive.